Excessive radial loads and shock loads can be accommodated since the Tolerance Ring is protected in its own cavity. The corrugations will deflect until the shoulder or stepped diameter contacts the mating member. Additional loading will be transmitted through the step, and will not act to further deflect or crush the corrugations. This arrangement is similar to the centered configuration, at a lower cost. 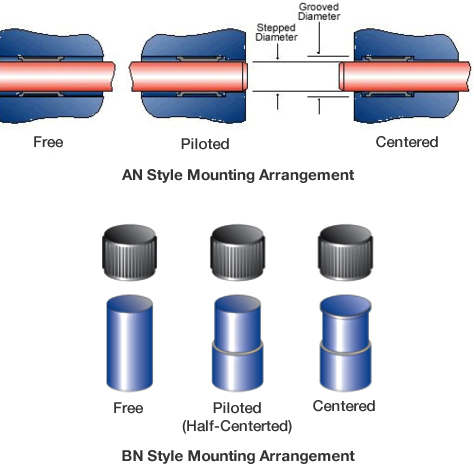 With the exception of piloting for alignment, this method may provide the advantages of the centered arrangement when the stepped diameter is held close to the nominal diameter of the mating component. This arrangement will not provide axial support to the ring in either direction, so the assembly machine must be fixtured to "back up" or axially locate the ring temporarily while the mating components are assembled. 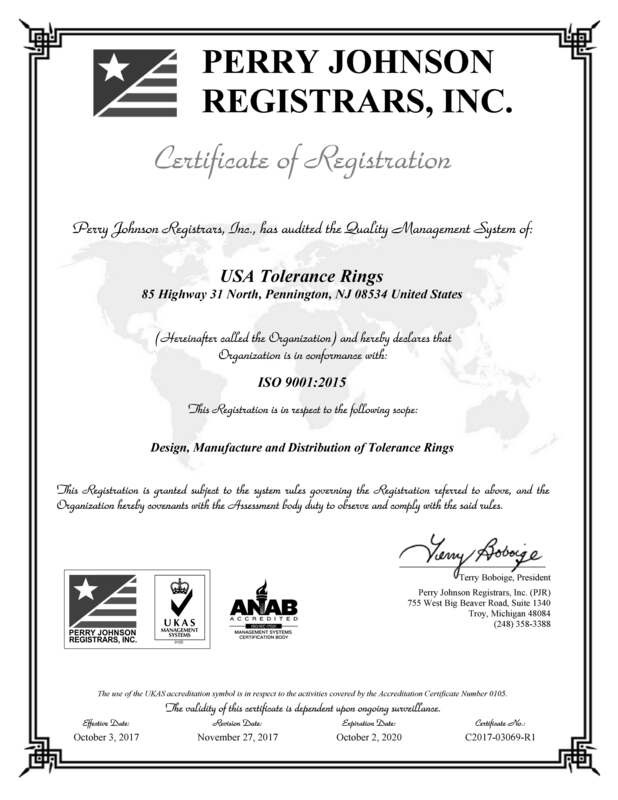 The Tolerance Ring will be subjected to all radial loading and should be selected with appropriate capacity. The "tops" of the corrugations (The I.D. on AN style rings, or the O.D. on BN rings) are formed with a rounded contour, which assists as a lead-in edge during assembly. It is very important that the lead-in edge of the mating part is contoured with a generous radius or a shallow (15o) chamfer. Sharp corners on the lead-in edge could dig in and mar the Tolerance Ring, sacrificing performance. Best results of assembling mating parts are achieved by using an arbor press and fixturing the parts to hold them squarely in place during assembly. Except for very light duty rings, aligning the parts by hand and/or hammering the assembly together jeopardizes alignment and performance. 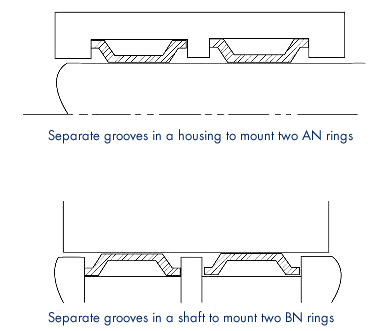 If misalignment occurs during assembly, there is a tendency for the lead-in edge of the mating part to flatten corrugations in one area of the Tolerance Ring, resulting in reduction of ring integrity. When using the centered arrangement, a small radius and adequate groove width should be used to ensure that the Tolerance Ring may be properly seated on the cylindrical surface. When an application requires a greater radial load capacity, torque capacity, or width than may be provided by a single Tolerance Ring, more than one ring may be used. It is necessary to separate the rings by a flange or shoulder to prevent the rings from overlapping.